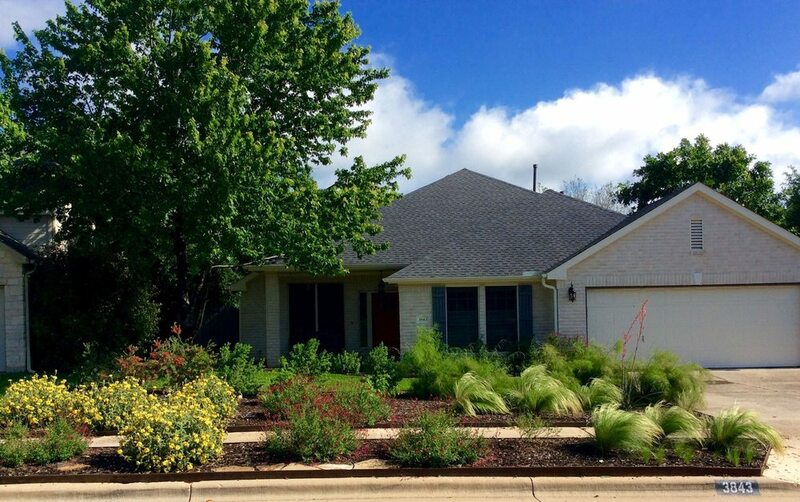 The Wells wanted a clean and bold modern landscaping in the front yard and a more relaxed hill country look in the back. Mr. and Mrs. Wells contacted us shortly after their beautiful modern South Austin house was custom built. The existing landscaping was new build standard; that is, very basic front landscaping, poor lawn in the front and a large exposed soil in the entire back yard that slowly but surely was turning into a weedy muddy pit. The Wells wanted a clean and bold modern landscaping in the front yard and a more relaxed hill country look in the back. The property had mostly full sun in the front and mostly part and full shade in the back. The clients did want some real lawn sod for both front and back as they were thinking about getting a dog and also having a room to play with their daughter. After a few design meetings and revisions, we put together with the client a clean, functional and thoroughly modern landscape for their west Austin home. We decided to go with a custom fabricated and welded Corten steel retaining wall to really set the tone for the entire project. The front lawn sloped sharply toward the street, and the retaining wall allowed to turn the front lawn into two terraced levels the upper being a soft green palisade zoysia lawn for the family to enjoy, and the lower a xeriscaped ornamental garden presented to the neighborhood. The Corten steel retaining wall turned out sharp and is definitely the focal point driving towards the house from the street. We decided to go with the dramatic black-gray Tejas Black Gravel for that monotone stark look for both the driveway and the front planting bed facing the retaining wall. To set the retaining wall into a strong foundation, we cut as deep as two feet below grade into the heavy west austin limestone and caliche. In order to maintain a smooth face instead of a large drain to relieve hydrostatic pressure, we drilled a series of “weep” holes below the grade of the black gravel to allow any moisture from behind the wall to drain into the xeriscape beds, and reduce pressure on the Steel, without an unsightly drain near the driveway. One request was to create a nice clean privacy planting between the house and the neighbor on the left side. We used Italian cypress trees as they are evergreen, perform well in a tight and narrow space and go well with the motif. They are also fairly drought resistant! We created a dedicated bed for those trees to ensure that they have a nice foundation of tilled and amended soil to ensure optimal results. For both the privacy bed and on the other neighbor side, we used a 2” grade Colorado River Rocks. Those are relatively inexpensive and unlike organic Hardwood Mulch won’t require early replenishment. Because there was partial shade in the front we decide to use Zoysia Lawn Sod. We used the “Palisade” variety which had an excellent performance track record on our previous jobs. That sod variety is thick, has a great bold green color and will take both Full Sun and Part Shade unlike other lawns. It is also much more drought resistant then the St Augustine Lawn Sod which is a great benefit. We used a few ornamental boulders and a sparse planting of Ornamental Grasses. We picked Bamboo Muhly and Mexican Feather Grass. We also installed a Red Yucca to add further interest. Mr and Mrs Wells wanted a good portion of their back yard to have lawn for both a future dog and an area to play with their daughter. They also wanted some interest and privacy along the back yard fences. We reduced some of the lawn by using organically shaped river rocks beds. For the privacy plantings we went with “plain” Eleaugnus plants, which although are not native, do have a few undeniable advantages for that space: They will take considerable shade, they are extremely hardy and fast growing, they are evergreen and lastly they are very drought resistant. Although not known for their flowers, those shrubs are great when you want to establish quick, and hassle free privacy in both Full sun and Part Shade. In the mulch beds under the trees we had the most shade so had to resort to considerable shade tolerant plants. We decided to install Turks Caps, Texas Betony, Plumbago and American Beauty Berry. Mrs Wells really liked the looks of ferns so on the right side beds, we used plenty of Foxtail Fern plants. All the beds, front and back yard, where irrigated with efficient drip irrigation, using an automated and well tuned and programmed irrigation controller.